On July 19, the Recycling Economy Bureau of the National Development and Reform Commission established an assessment group to carry out assessment and examination on the achievements made for more than 1 year by Tianguan Recycling Economy Education and Demonstration Base, and finally affirmed that Tianguan Group met the requirements, determine it a national recycling economy education and demonstration base and hung out shingle. Tianguan Group made biomass energy and waste recycling industrial chain as its core, built industrial system to connect recycling as its feature and was selected to be one of the first batch of national recycling economy education and demonstration bases in November, 2011. Since the operation of the base, the Group has started from improving hardware facilities, perfecting guarantee system and enhancing energy coupling to intensify construction, actively carried out recycling economy training, exhibit straw made fuel ethanol and other technique to the public and the achievements of recycling economy in China in the current stage and spread the recycling economy knowledge of “minimization, recycling and reclamation”. It has successively received technical secondary schools as well as entrepreneurs from different cities, scholars and friends from abroad, more than 3400 people and effectively promoted the exhibition and extension of Tianguan recycling economy development mode. The assessment group expressed satisfaction with the operating achievements of Tianguan Recycling Economy Education and Demonstration Base, and meanwhile, they gave opinions for the future development. 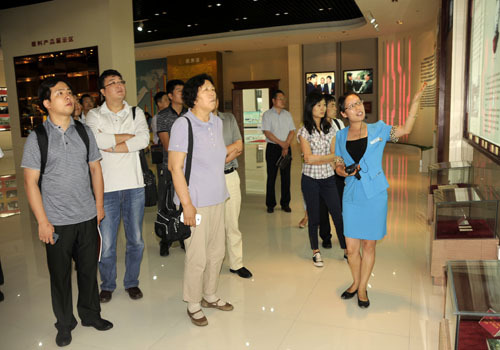 The assessment experts believed that for the next step Tianguan Group needed to further improve the interaction of featured publicity and education methods and overall line and made visitors know recycling economy in experiences.